The project plans to pave the way to better bigdata systems that will improve quality of urban life in terms of sustainability, services and safe mobility, while preparing the technological background for the advent of autonomous vehicles. 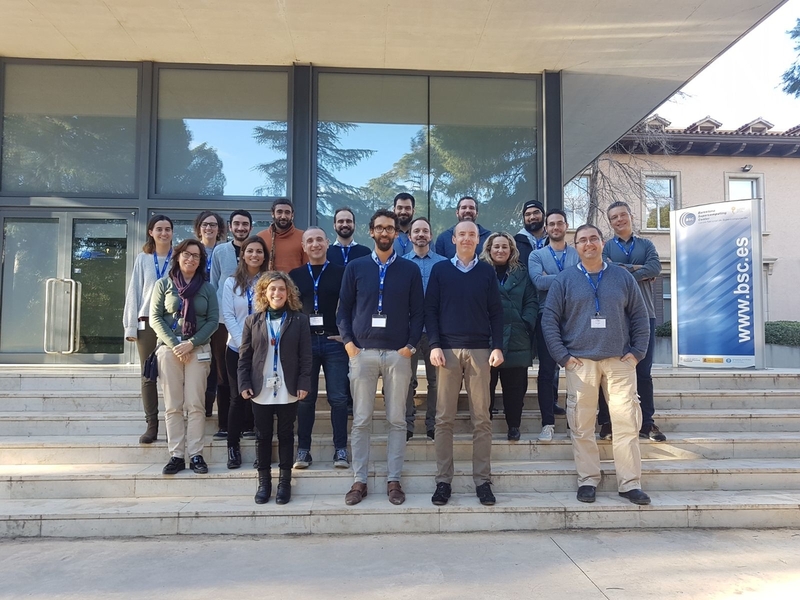 CLASS launched its activities last week at Barcelona Supercomputing Center (BSC). Smart cities and autonomous vehicles are the near future. With total funding of €3.9 M, the European project CLASS, coordinated by BSC, aims to develop a novel software architecture that will help software developers to design and efficiently execute big-data workloads with real-time requirements, increasing significantly the data analytics capabilities of smart systems. To do so, CLASS aims to converge and evolve high-performance, low-power embedded and big data analytics computing technologies into a unified software architecture capable of efficiently coordinating and distributing computation resources along the compute continuum (from edge to cloud), while providing real-time guarantees. The software architecture will be based on COMPSs, the software framework developed at BSC to design and execute high-performance applications in distributed cloud environments. COMPSs will be enhanced to support the distribution of computation among both cloud and edge computing resources, while providing real-time guarantees to the overall work-flow execution. CLASS technology will be tested in a real urban area of one square kilometer in the city of Modena, using three prototype vehicles provided by Maserati and equipped with the necessary sensors and connectivity to allow drivers to use their innovative functionality. The project kicks off today and tomorrow with its first face-to-face meeting at BSC, where partners will discuss first research project activities and the next steps. The project plans to pave the way towards better big-data systems applied to the smart city domain that will improve the quality of city life in terms of sustainability, services and safe mobility. In addition, the project will prepare the technological background for the advent of trustworthy autonomous vehicles. Among the targets that CLASS aims to reach are the following: improving overall traffic management by 20%; reducing pollution by 20%; reducing the response time of emergency vehicles by 30%; reducing the amount of accidents by 30%; and reducing the time spend looking for a parking space by 40%. The research conducted in CLASS will not only apply to the smart city domain, but also to any smart system with data analytics and real-time requirements (e.g., smart manufacturing). To that end, the project includes an Industrial Advisory Board in which companies from other smart domains will monitor the project, opening the door to new market opportunities involving the use of big data analytics in the critical embedded system market. “CLASS represents an excellent opportunity for BSC to develop the new generation of highly distributed computing systems with data analytics and real-time requirements, capable of coordinating computing resources along the compute continuum with the objective of increasing the intelligence of smart systems”, says Eduardo Quiñones, CLASS project coordinator and BSC Computer Sciences researcher.